Each piece is a 3-dimensional sculpture representing its own unique meaning, purpose and qualities. For example the pictured Star Dodecahedron, one of my favorites, is considered the true Merkaba for spiritual awakening, greater love and compassion. Stimulates the heart to renew deep appreciation for life. These forms are precisely composed radiating an energetic field to positively influence your well-being, purpose, health, spiritual evolution and reduce stress. Highly vibrational and energetic to support the shifting that is taking place to ‘awake up’ and raise our consciousness to who we truly are...the expression of LOVE IN FORM! These products are created by and shipped from Metaforms. Once you place your order you will receive a confirmation of sale from them. It is designed to provide a full range of integrative connections that enhance vitality, health and conscious awareness. It establishes a field around you that affects everything that it touches. This means that many people are connecting more to their “higher” self, experiencing joy, compassion, well-being, peacefulness, heightened meditations and physical improvements. 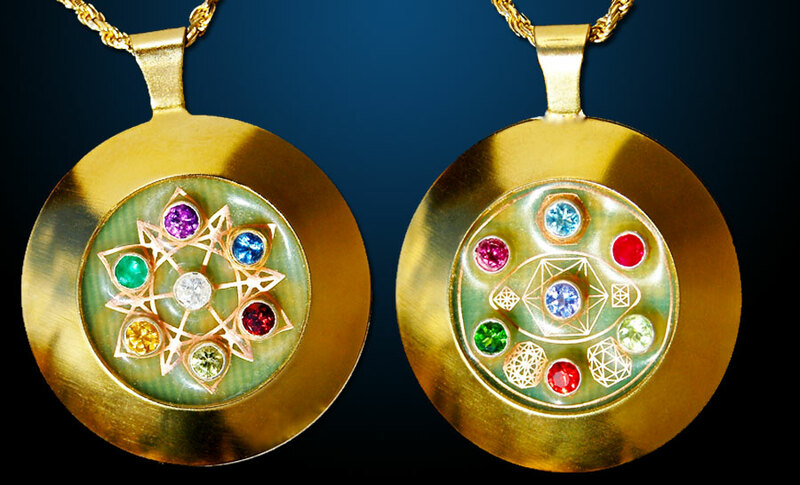 The gems act to move energy from the higher dimensional frequencies into the physical world. This increases the energy flow into your body with the chakras being the receivers of these energies. The Heart Companion cuts through the chaotic stress of everyday life establishing a connection to the rhythms of the natural world found by a peaceful stream.